An electric car is a vehicle that runs purely on electricity that’s supplied by a battery-powered electric motor. Unlike hybrid and plug-in hybrid cars, electric cars do not come with the ability to use fuel and must instead by charged at the mains. Electric cars are yet to gain mainstream popularity but that could change in the very near future as many top car manufacturers such as Toyota and Volkswagen, are putting their efforts towards electric cars. 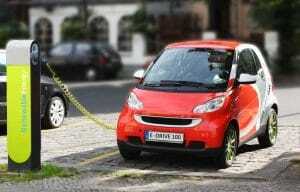 Below are some of the advantages and disadvantages of electric cars. You’ll also find a section to help you decide if an electric car is right for you. Electric cars offer a very smooth and quiet drive that many people find preferable to a petrol or diesel engine car. The running costs are very low compared to a petrol or diesel engine car – approximately 1/5 of the cost. You can get a government grant for 25% (up to £5,000) of the cost of a qualifying electric car. Electric cars come with zero company car tax, making them ideal for business use. Although electric cars cost more initially, the vast fuel savings mean it’s worth the added expense upfront. The majority of electric cars have a limited driving range – usually 80-100 miles. This means you’ll need to charge them at least once if you’re driving long distance across the country. Electric cars are quite expensive to buy but it’s worth bearing in mind that government grants are available and that you spend much less to keep it running. Not only are there no fuel costs but the tax is free too. You will need to have access to a charging point in order to charge the battery of your car. You can apply for a grant to have a domestic charging point installed at your home. If you’re driving at high speeds on the motorway then the battery will get drained faster, reducing driving range. An electric car is a great choice if you don’t need to drive long distances of more than 80-100 miles each day. Providing you have a charge point at home and ideally one at your work, then an electric car is a great way to save on fuel costs and help the environment.